The cemetery is about 100 yards west of the road. 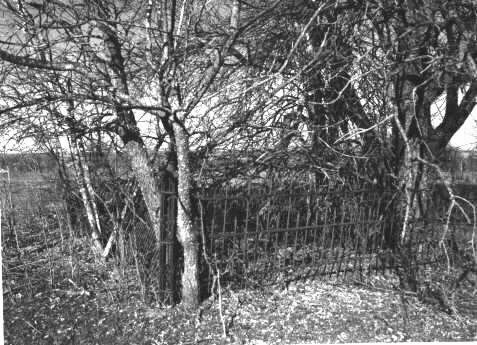 It is about 20-feet square surrounded by a 4-foot wrought-iron fence. Part of the fence has fallen down. There are small trees next to and inside the fence. Cows have used the pasture, but there is no evidence that the cows have been inside the fence. There does not appear to be any grass or weeds inside the cemetery. The cemetery is completely shaded by the intertwining and fallen branches of the trees. There are no stones in the cemetery except for a foot marker with the initials "W. A. B." When this cemetery was visited by the authors of COLLIN COUNTY CEMETERY INSCRIPTIONS II, there was a headstone for W. A. Bumpass. This cemetery is totally neglected. According to relatives, this was the Bumpass family farm named Rose Hill. When the Farmersville Cemetery opened, all of the family graves were moved there from here except William A. Bumpass. He was mentally deficient and his grave was left behind.